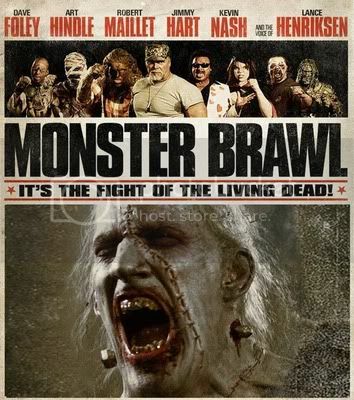 MONSTER BRAWL - It's The Fight Of The Living Dead! It's midnight at the Hillside Necropolis and the stage is set for the first ever Monster Brawl main event! Eight of the world's most legendary monsters along with their diabolical managers compete in a wrestling tournament deathmatch to determine the most powerful champion of all time. Interviews, pre-fight breakdowns, trash talking, and monster origin segments round out this ultimate fight of the living dead. This award-winning monster mashup features an ensemble cast of comedy, horror and wrestling icons, including Dave Foley (Kids In The Hall), Art Hindle (The Brood), Lance Henriksen (Aliens), Robert Maillet (Sherlock Holmes), Kevin Nash (The Punisher), Herb Dean (UFC), and Jimmy Hart (WWE).